Sea and Reef is at it again with more designer clownfish releases. About two weeks ago they announced the Gold Nugget Maroon Clownfish and last week they announced the Gold Dot Maroon clownfish. The Gold Nugget Maroon Clownfish is a variation of the Gold Stripe Maroon Clownfish. Instead of the 3 distinct golden bands or strips that run vertically, the Gold Nugget Maroon exhibits a solid golden coloration covering most of the fish’s body. The face and fins are a deep maroon color with various spots and markings displayed on the maroon’s face. The golden color penetrates the base of each fin and most of the dorsal fin. Remarkably, as juveniles the Gold Nugget Maroon starts out white. As they mature they develop their characteristic golden hue. The color change typically begins to occur when the fish reaches 1 to 1 1/2 years old or about 2″ or larger in length. Like the Gold Nugget, the Gold Dot Maroon Clownfish is a designer clownfish based on the Gold Stripe Maroon Clownfish. 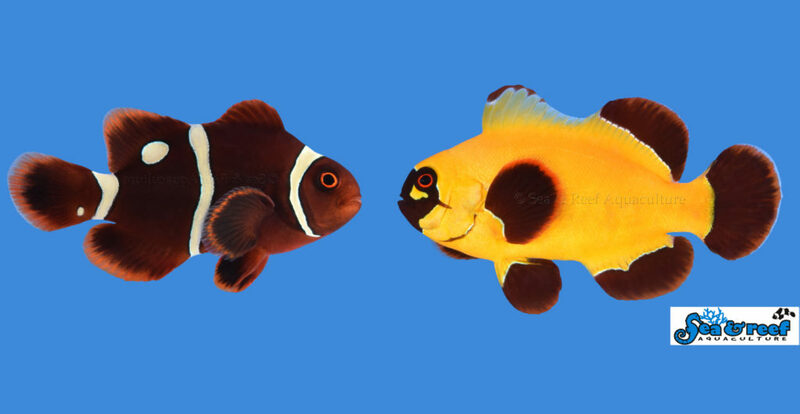 Several designer clownfish strains have been developed from Gold Stripe Maroons, including the Gold Flake Maroon. The Gold Dot Maroon has one or more oval or round spots on its body. The spots typically occur on the posterior part of the body, but not always. Each fish has unique markings. Like the Gold Stripe Maroon, the stripes starts out white and as the fish grows and matures, a color change occurs and the stripes and spots deepen to a beautiful golden yellow. To learn more about these new designer clownfish and other captive bred fish, visit the Sea and Reef website.